For the match made in heaven our wonderful trio wedding set of rings for 'him and her'. Lovingly crafted in gold, two tone, and white gold our trio wedding sets feature combinations of lady's and gent's wedding band and lady's engagement rings. Diamond trio wedding set. This 14k Yellow gold with Rhodium accents is an affordable trio set. Ladies engagement ring is set with .09ct of round diamonds. Matching band holds an additional .06ct accent diamonds. Gent's ring is accented with .06ct of diamonds. Stock Size ladies 6; gent's 10. Ring sizing available add your ring size to the comment box during checkout. Pretty 14k White gold diamond engagement ring. This ring is part of a wedding trio. Price shown is for the engagement ring set with .17ctw diamonds. Ladies diamond band and matching gent's band also available for additional cost. 14k White Gold Glitzy Design Trio wedding set. Price shown is for the ladies engagement ring. White Gold Bands with a mirror ball design create this Unique matching wedding set. Gent' s ring measures aprox. 5mm wide and is accented with 3 .01ct diamonds. The ladies engagement band has a .05ct tw center , matching band accented with 3 .01ct diamonds. Sizes other then stock are non returnable. To order more then one ring simply put one in your cart then push the back button and add another. Beautiful 14k Two Tone Trio wedding set. 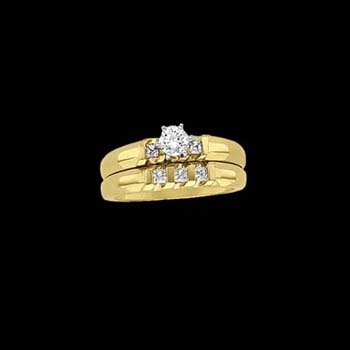 Our price shown is for the ladies engagement ring, use the drop down menu to add additional rings to the set or use the trio set option to purchase all three rings. Gent's band is 5mm wide and is accented with 3 diamonds totaling .09ct tw. The ladies set is aprox. 8mm wide and together . The engagement holds .09ct tw, matching band .06ct tw. A nice wedding trio set. 14k White gold diamond trio wedding set. The diamonds total .45ct tw in this lovely set. Ladies engagement ring features 9 diamonds invisible set in a diamond shape. Our price shown is for the set, a very nice wedding trio set at an affordable price. 14k White gold diamond trio wedding set. This diamond trio set is comfort fit and set with .40ct tw diamonds. 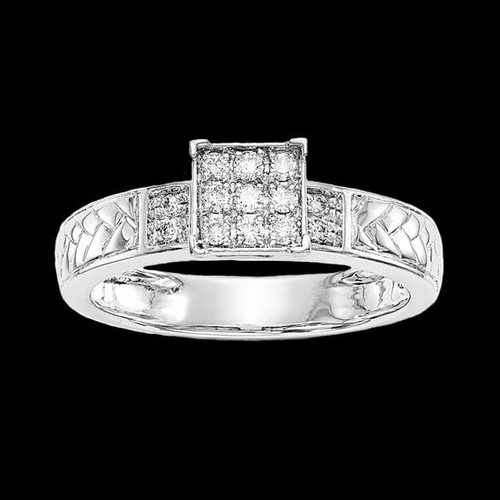 Our great price is for all three rings, you'll love this classic design. Princess diamond wedding trio set. You'll Love this gorgeous invisible set princess diamond design, diamonds total 1.3 carats for the ring set. The ladies engagement ring features a square center set with 9 diamonds creating a much larger look. Beautiful milgrain edge design diamond trio wedding set. This 14k white gold wedding trio set totals .40ct tw and you'll just love it. Diamonds are round and channel set in each of the 3 matching rings. Very nice wedding trio set. 14k white gold diamond trio wedding set. Diamonds total 1.10ct tw in incredible wedding set. Make a solid commitment with this block style very affordable, wedding ring set. You'll love this matching diamond wedding set. 14K White Gold Trio Wedding Set. The Center diamond is a .05ct tw set in an illusion setting. Price shown is for the ladies engagement ring, use our drop down menu to add rings to this set or to purchase all 3. Diamonds total .04ctw in the gent's ring. Lovely and very affordable trio bridal set. **If you order all three rings please use the comment box for sizing information. 14k White gold concave design channel diamond trio wedding set. Price shown is for the ladies engagement ring set with .07ct tw. Match band also available set with .034ct accent diamonds. Gent's wedding band features .055ct accent diamonds. Purchase one ring, two rings, or the set of three. To order 2 rings simply put one in cart them back up and add another. 14K White Gold Diamond Trio Wedding set. Our price is for the ladies matching band. Gents ring holds .03ct tw diamond, Ladies .10ct tw Diamonds. Center diamond is .05ct tw round. Buy the entire set of just one of this set. Trio wedding sets are a very affordable way to have that complete wedding set. To order more then 1 ring put first one in cart, then back button and add another. We are happy to size these items for you sized items are non returnable. Add your size to the comment box during checkout. Lovely round diamond wedding trio set. You'll Love this beautiful 14k white gold round diamond design, diamonds total .85 carats for the ring set. Our price shown is for the ladies engagement ring, ladies matching band, and the matching gent's band. A wonderful damond trio wedding set. Email for pricing to order just one or two rings in this set. Vibrant 14k White gold diamond wedding trio set. Pretty 14k white gold engagement ring is set with 9 princess cut diamonds that give the illusion of a larger square diamond center. Accent diamonds on all three rings and the center total 1/2 carat. Our great price is for the ladies engagement ring, ladies matching band, and the gent's matching band. Email for pricing to order just one or two rings in this set. Two tone diamond trio wedding set. This 3 piece wedding set is set with 1.25ct tw diamonds including the engagement center diamond. The gent's ring is a perfect match to the ladies engagement and matching band. Our price shown is for all three ring in 14k gold, but these are available in 14kt, 18kt, or Platinum metal options. Your rings will forever symbolize your love for one another, as well as your past, present, and future together. What better way to do that than with matching rings? The bride and groom can share this special time in their life with matching timeless designs. Lovely two tone slant design diamond wedding set. Diamonds total .60ct tw in this 14k two tone gold set. This trio wedding set is also available in 18kt, or Platinum selections. (made to order) Your rings will forever symbolize your love for one another, as well as your past, present, and future together. What better way to do that than with matching rings? The bride and groom can share this special time in their life with matching timeless designs. 14K Gold Trio Wedding Set. A VS clarity Princess Cut 1/2ct Center diamond flanked on either side with .20ct tw VS baguettes. The Gents ring holds three princess cut diamonds, .18ct tw. Available in yellow or White gold. Our price is for the wedding trio set of three including the incredible VS center diamond. Alternate diamonds are available for this ring and will alter the price, use our request link to email us for pricing. 14k Gold Diamond Trio Wedding Set. This incredible wedding trio set totals 1.10ctw for the set. Ladies center diamond is .33ct. Gent's matching band is set with .48ct tw SI 1 square diamonds. Our fantastic price is based on SI 1 clarity G-H color diamonds. We're happy to use alternate diamonds from VS1 to SI2 in this lovely wedding trio set. Our listed price is for the set of 3 wedding rings. 14k Gold Trio Wedding Set. Available in Yellow or White Gold. Center diamond is 3/8ct tw SI G-H color, price is for the 3 ring set. Like this ring but looking for slightly smaller or larger center? Simply email for a price. Order complete set of just one of these lovely rings. Nice Set.